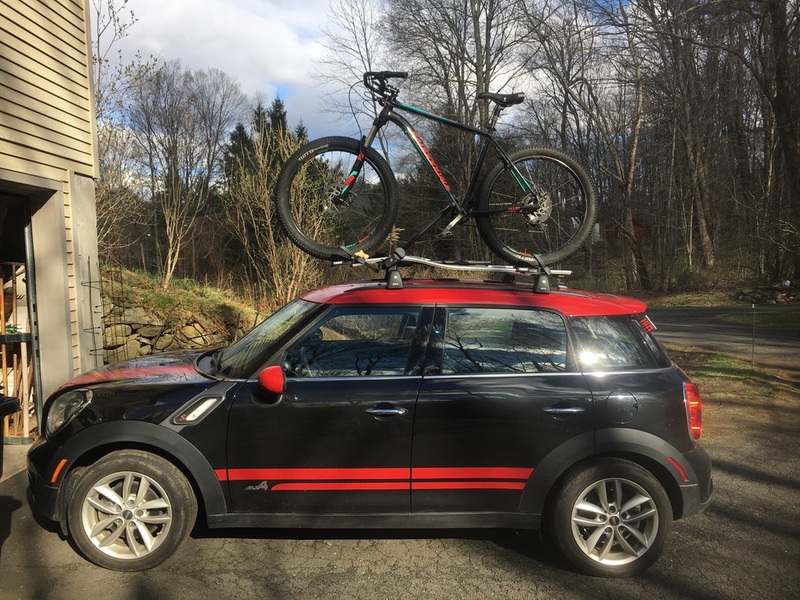 The other day I picked up a barely used OEM Mini branded bike rack to match the other one and to carry my mountain bike. 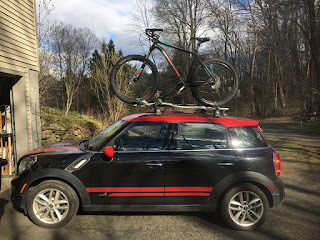 It's actually a Thule rack. I got the Thule Fat Bike adapters but found that there were some slight variances between the molding on the rack vs the adapters, but I was able to get them fit. The one thing that gave me a problem was the fact that my Cannondale Cujo has such a high bottom bracket that I had to play around with the tire holders to get the bike to be held snugly. Finally, I got it set right and test drove it on the highway at 70 mph and it held fine! 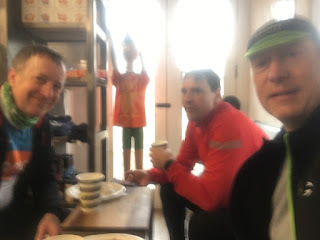 I was planning on a dirt century this weekend in preparation for the The Lu Lacka Wyco Hundo but then Gavin wanted to know if I wanted to do a road century with him instead. I said sure but it would have to be Sunday. He got the all clear from his better half and then I suggested that we ride to Great Barrington via Route 7 and get some lunch at the Barrington Brewery. The route I planned left from the Bicycle Center in Brookfield and skirted Rt 7 where it could and where it could not then we were on Route 7. I have always wanted to ride it up this way so this was a perfect opportunity. Starting out was cool but by the time we got to New Milford the jackets came off. We brought jackets because there was a threat of rain in the afternoon but despite a little drizzle in the afternoon the jackets never came back on. Between Cornwall and Kent I recognized Terry Burke's car and waved to him but I don't think he recognized me. 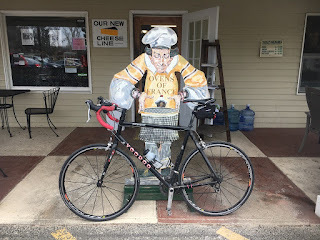 Terry rides all over the Northwest Corner of Connecticut. Later on, Gavin stopped for something to eat and Terry drove up to us and stopped to have a little chat. How ironic it was to pass him further south and then run into him again in Canaan. 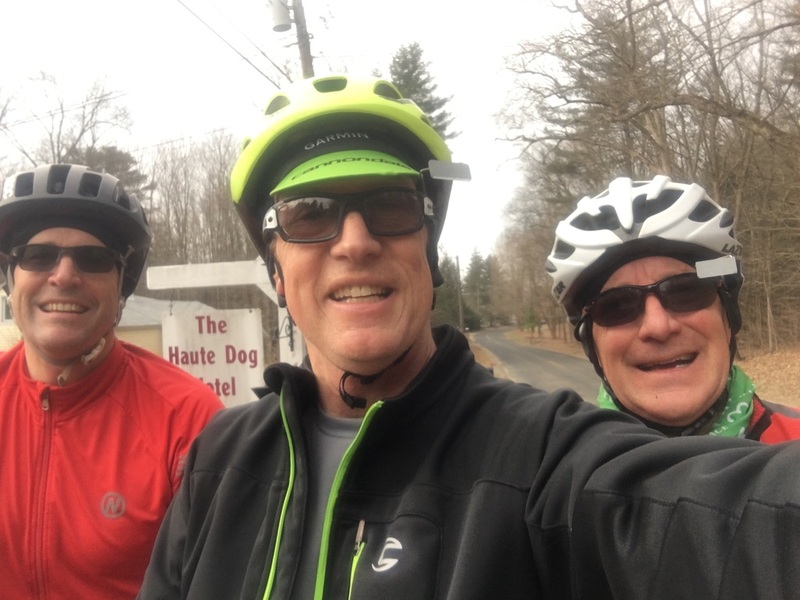 We crossed into Massachusetts on Route 7A but had to head back to Rt 7 again because the bridge over the Housatonic River was finally being rebuilt and couldn't ride across it like we did on the Big Elm Ride last year. 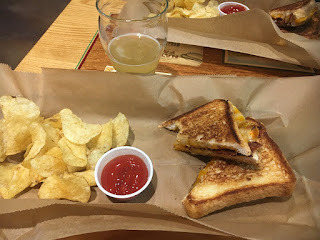 We stopped at the Barrington Brewery for lunch and we both had the Black and Tan, but all it was black. Still, it tasted great. I had the Chick Cordon Bleu for lunch but that was a mistake because it sat in my stomach the whole way back to Brookfield slowly digesting. I should have just had a big bowl of the Chili. 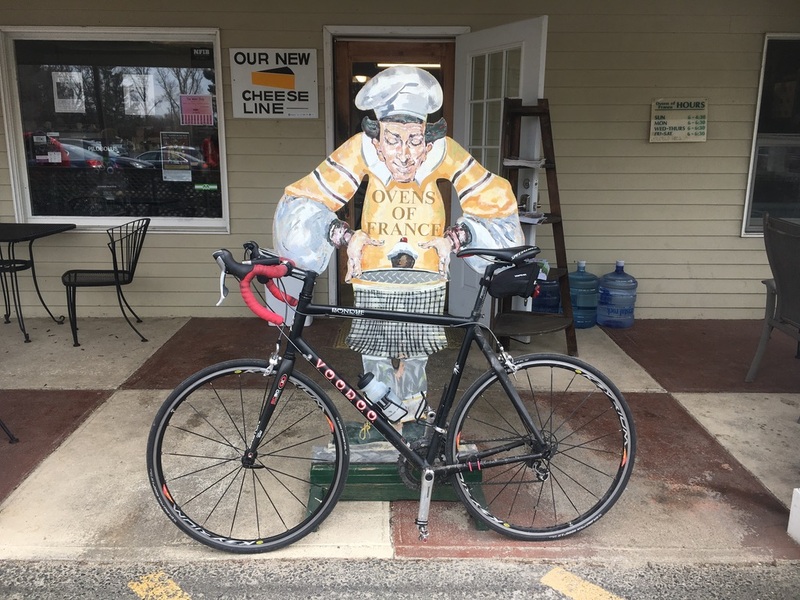 On the ride up to Great Barrington we had a head wind. On the ride back, the wind changed direction and we had a head wind, again! The ride back was slower probably due to the headwind and other factors, e.g. exhaustion. There was one little scary moment on Rt 7 between Covered Bridge and Housatonic Meadows when an 18 wheeler wanted to pass on a curve and there was no shoulder. He left us about 3 feet of room as the law dictates but he drove past us slowly which made the encounter a little unnerving to say the least. This could have become my biggest ride to date if we had tacked a little something on. However, it was the longest ride for Voodoo Bondeye. Gavin wanted to do a big ride Saturday morning with the early warm temperatures we were experiencing but with my wife out of town there were fatherly duties to attend midday Saturday. We decided to part company at Ovens of France. For some reason, I can never get the transition down when crossing Route 6 and we always wind up back on Route 6. Nothing beats OOF on a Saturday morning, though, or any morning for that matter. The danish, as usual was out of this world. I have switched from strictly the Ham and Cheese Croissant to favoring the Chocolate Almond Croissant. 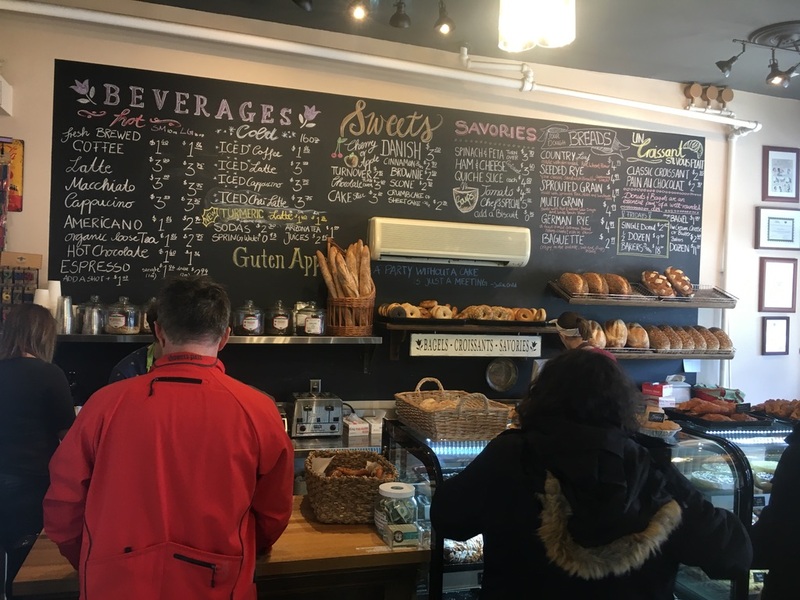 Add a cup of hot, French Roast coffee, some great comrades and it's a great breakfast. Gavin and Mike were headed on a route that I came up the day before that I call the Devil's Poggio. 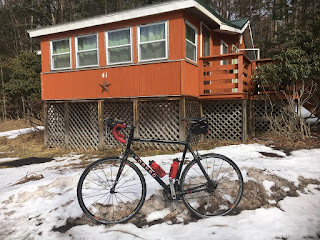 From OOF you head back on Rt 6 to Rt 47 and then turn off on Rt 132 towards Bethlehem and the big climb, known to the local riding community as the Southwestern CT version of the Poggio. From there, cut through the southern section of Bethlehem and over to Magnolia Hill Road passed the Devil's Valley Farm where we saw a rough looking, chainsaw wielding woman last year. Then bomb down Hard Hill, ride out past Quassy and then back to OOF and the yuuge route to Cover Two. 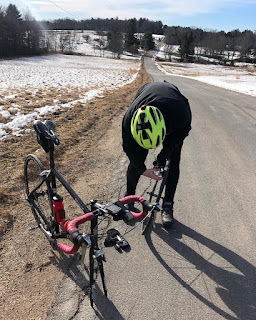 I met Steven, Mike and Gavin at the Easton Library for a RAW (ride after work) and as I was getting ready realized that I brought the wrong gloves. 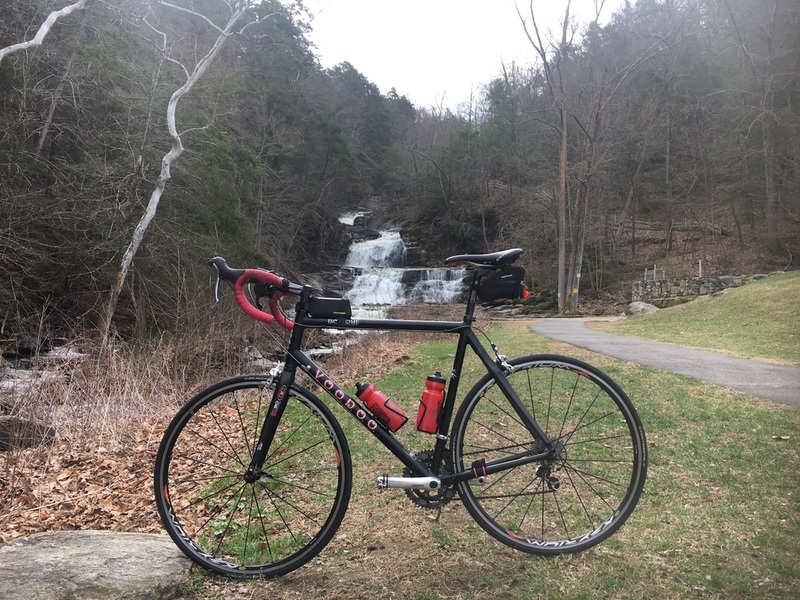 My hands were freezing the whole time but still managed to have a great ride. Afterwards, we went to the Red Rooster for beer and dinner. 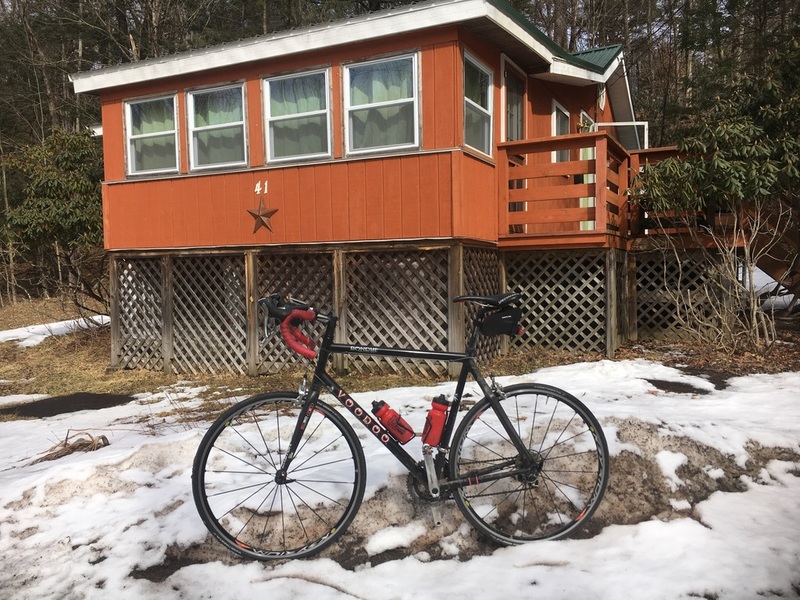 Gavin and I drove to The Great Pumpkin Cabin in Smallwood, NY early Sunday morning for 60+ mile ride in the Catskills. We got off to a delayed start due to Gavin getting snow stuck in his cleats and he couldn't get clipped in. By the time we started rolling my fingers were freezing and I was trying to warm them up as were riding. The night before I finally replaced my Continental Grand Prix 4000sII tires with new ones. While we rode out from Gavin's cabin I noticed a hop in the front wheel. I stopped to check it out and found that the bead had come unseated. I had to use a CO2 cartridge to re-inflate the tube and this time it held. 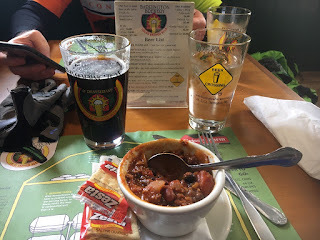 When we got to While Sulphur Springs we turned onto Dahlia road and started climbing but at 15 miles in we came to a hill that we weren't expecting and stopped for a snack . It's a Class 3 hill with a max grade of 12%. Gavin led the way up most of the hill but had to stop 3/4s of the way up so I went up ahead of him. Then we had a really nice downhill descent along the Little Beaver Kill. 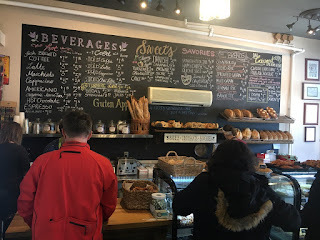 We came out onto Old Route 17 and our route took us to Livingston Manor where we stopped for hot chocolate a the Brandenburg Bakery. From there we rode parallel to Highway 17 and then came back to Old Route 17. 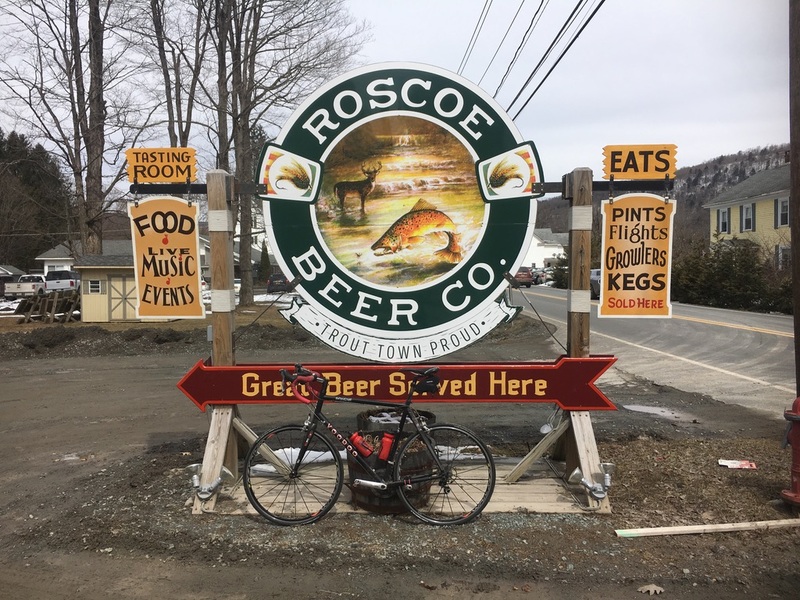 We stayed on this until we got to Roscoe and then eventually stopped at the Roscoe Brewing Company for lunch. Gavin went for the Brown Ale while I went for the lowest alcohol beer, the Wheat Beer. It didn't have that German style wheat flavor, rather more of an American style flavor - it sucked. 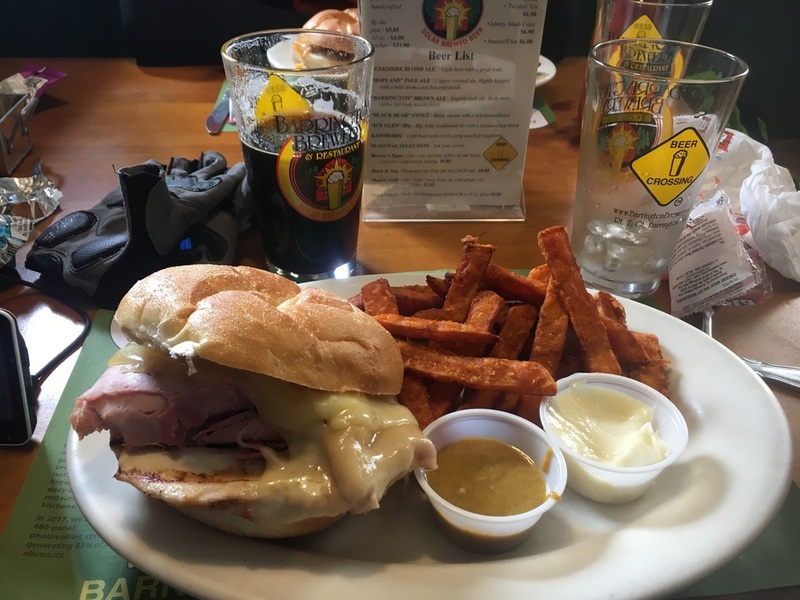 Lunch, however, was awesome. We both had the 3 Chili Cheese and Bacon Grilled Cheese sandwich. Back on the bikes we decided to call an audible and take the fastest way back to the cabin which turned out to be almost the same distance if we had stayed on the original course. 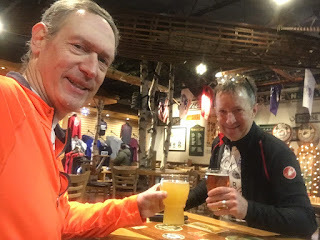 The big difference was missing the big climbs, going from the Beaver Kill river valley to the Willowemoc river valley and then climb out from there and eventually make our way to Liberty. From there we followed Rt 55 back to Smallwood. I am glad I didn't wash my bike after last weekend's ride because today the bike just got dirtier.